This week I’m going to do something a bit different and get a bit personal. Instead of reviewing a book or offering a list of tips, I’m going to share with you an essay that I wrote late one night when I couldn’t sleep. I had just finished a chapter in Ann Patchett’s This is the Story of a Happy Marriage about how you just have to get up and write and was inspired. Now, I don’t consider myself a writer or an essayist, but because the surgeries I write about in this essay took place around the New Year, I’ve decided to bite the bullet and share a little something about myself that isn’t related to books, dogs, or politics. If you make it through the whole thing, then I give you my sincerest thanks! I’ve always wanted to be a runner. I’m in awe of the people I know who run 7 miles a day and boast about their “runners high” and getting “in the zone.” The problem with my plan is that I hate running. And sweating. And exercising. I’ve spent thousands of dollars on unused gym memberships because every time was the time I would get over my hatred of exercising. I’ve also spent hundreds of dollars on sporting equipment. Over the years I’ve purchased yoga sets, weights, treadmills, and ellipticals, not to mention all of the shoes and workout outfits that I just had to have for motivational purposes. 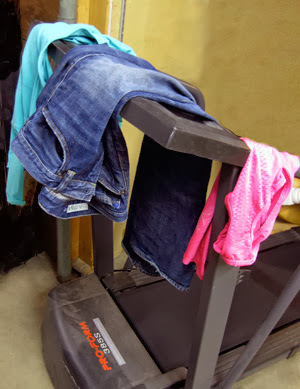 Invariably, the equipment ended up either at Goodwill or as makeshift laundry racks. As for the adorable workout outfits, they made great pajamas. 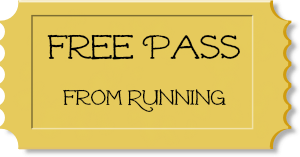 So when I quit smoking in late 2009, I decided it was high time to give running a shot. But I knew I was about to gain weight, so I rationalized that I should wait 6-8 months so that I wouldn’t be fighting a losing a battle. After 8 months, I was ready. Now, given my history of expensive attempts at exercising, I shouldn’t have been surprised by the blank stare my husband (pre-marriage) gave me. This time, however, was going to be different. I explained to him, for the third time since we had met, that I could really do it. Besides, I had gained 15 pounds after quitting smoking and needed to do something about it. Honestly! I even had this great smartphone app that would motivate me and a brand new workout CD to pump me up. And to top it off, our apartment complex had a gym. All I had to do was walk the 1,000 feet to the gym and get on the treadmill to achieve my new dream of running a 5K. (I should note that we also had a pool, but I needed to work out to fit into a bathing suit before I would swim to work out). But first, I needed to tie up some loose ends on the medical side. I was diagnosed with scoliosis at 17 and, being the slight hypochondriac that I am, I wanted to make sure my back was in the right place before I started running. It seemed like the responsible thing to do. When I walked into the doctor’s office for my x-rays, I was filled with a sense of purpose and, perhaps, a bit of smugness. I was going to be a runner! I had big plans. Unfortunately, my body had other plans. As I was leaning up against the cold slab on the wall to have my x-rays taken, I felt a little pop in my hip. It wasn’t a big deal, really. It didn’t hurt and it happened fairly frequently, so I wasn’t too concerned. The nurse, however, was concerned and left me freezing in an attractive, backless gown in the x-ray room while she “conferred with the doctor about this new development.” Five minutes later, I was stretched out on a different cold slab with the x-ray machine scanning my hips. This is where the trouble started. According to my doctor, my x-rays were “interesting.” I don’t know about you, but for me, “interesting” is usually code for “bad news.” This was no exception. It turns out that, while my back was more or less the same as it was 5 years earlier, my hips were impinging. In layman’s terms, the top of my leg bone (the femoral head) was squishing into my hip socket, which is why I was popping. 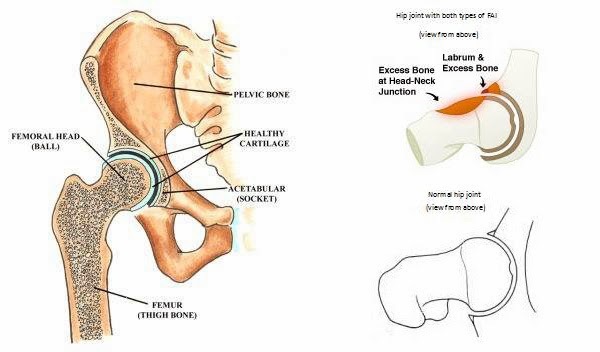 On top of that, the squishing of bones resulted in a bone spur which would, in time, cause cartilage damage and result in a total hip replacement. Then came the kicker. My doctor asked if I was a long-distance runner. As it turns out, impinging hips is very common in runners. Oh, the irony! I wasn’t sure if I should laugh or cry. To be honest, I probably did a little bit of both. The next thing I knew, my doctor was explaining to me my surgical options (surgery?! ), telling me not to start running, and that I was being referred to some fancy surgeon at Duke. As soon as I got home, I started researching this thing he said I had: Femoral Acetabular Impingement (FAI). Now, I’d oftentimes felt that I lived in the body of an old woman (likely due to my lack of exercise), but now I had incontrovertible proof: my hips appeared to be aging me at over 60. Even lifetime runners didn’t have the level of impingement that I had at 27. This became even more evident a few weeks later as I made polite chitchat with the x-ray technician at Duke (thank you, modern medical insurance, for the redundant procedures). He could barely control his excitement at seeing such an exacerbated case of impingement in such a young person, and a non-runner at that! A half hour later (which is pretty good, considering hospital wait times), I was sitting a room with a nurse and surgeon that would become more important to me than I ever would have expected. They explained to me that I had two options: wait and see how long it takes for the bone spur to affect my cartilage or have preventative surgery that would reshape my entire hip socket and femoral head/neck. Then my surgeon told me that my cartilage would likely be damaged to the point that I’d need a hip replacement by 30, which I would outlive, thus requiring another one when I was older (which is harder to bounce back from). Oh, and my other hip was following suit and was impinging, albeit it at a slower rate. So really, I didn’t have any options. Preventative surgery it was. As I prepared for my day under the knife, I started thinking about how, clearly, I was never meant to be a runner. I mean, the mere thought of becoming one sent my body into panic mode and, in the words of Shakira, the hips don’t lie. On an intellectual level I know this isn’t the case and that it was just luck of the draw, but the part of me that has always failed at exercise attempts saw this as a legitimate excuse for my prior laziness. See! I wasn’t lazy! I’m genetically and structurally flawed! Unfortunately, my rationalization attempts didn’t work on my husband or parents, who informed me that there were millions of other ways to exercise if I really wanted to. But as far as I was concerned, I was given the golden ticket. Runners could no longer tell me that I’d love it someday or that exercising is so much fun because I was structurally damaged. It wasn’t my fault. Now, it’s four years later, and I’m thinking about running again. A 5K doesn’t sound so bad. What could possibly go wrong? I’ve already had my two hip surgeries (turns out the lagging hip kicked it into high gear after the first surgery, requiring a fix less than a year later), the doctors have cleared me, and I’m no longer popping. Well, I’ll tell you why I can’t start running. I live in Denver, and the air is too thin. And it’s cold. And even if I started running now, by the time it becomes a habit it will be snowing and I’ll have to take a break. Oh, and my illiotibial band snaps sometimes (it connects your knee to your hip). But, even if it wasn’t snapping (which would be the case if I did some strength training), I still don’t have any workout clothes that fit. So you see, I can’t start running. The cards are stacked against me. And, of course, it’s not my fault.